Ending world hunger by 2030 would require an estimated additional $267 billion per year on average for investments in rural and urban areas and in social protection, three United Nations agencies dealing with nutrition estimated in a joint report Friday. This would average $160 annually for each person living in extreme poverty over the 15-year period. Prepared by the Food and Agriculture Organization (FAO), the International Fund for Agriculture Development (IFAD) and the World Food Program (WFP), the report was presented in Rome on Friday, just ahead of the Third International Conference on Financing for Development in Addis Ababa, Ethiopia, July 13-July 16, 2015. World hunger rates have been cut by roughly 50 percent during the 1990-2015 period, meeting one of the so-called Millennium Development Goals. But the report noted that despite the progress in recent decades, nearly 800 million people, most of them in rural areas, still do not have access to enough food. Eliminating chronic undernourishment by 2030 is a key element of the proposed Sustainable Development Goal 2 of the new post-2015 agenda to be adopted by the international community later this year and is also at the heart of the Zero Hunger Challenge promoted by the U.N. secretary-general, the WFP said in a statement. "The message of the report is clear: If we adopt a "business as usual" approach, by 2030, we would still have more than 650 million people suffering from hunger. This is why we are championing an approach that combines social protection with additional targeted investments in rural development, agriculture and urban areas that will chiefly benefit the poor," said FAO Director-General José Graziano da Silva. "Our report estimates that this will require a total investment of some $267 billion per year over the next 15 years. Given that this is more or less equivalent to 0.3 percent of the global GDP, I personally think it is a relatively small price to pay to end hunger," Graziano da Silva added. IFAD President Kanayo F. Nwanze also said unless people seriously invest in rural people, it is unlikely to see gains in reducing poverty and hunger. Some $116 million should also be earmarked for social protection measures for people below the extreme poverty line of $1.25 per day, while $151 billion should go towards rural development and food systems. The combination of social protection and investments brings the total to $267 billion, the FAO-IFAD-WFP report suggested. "This technical report should assure everyone that our proposal to end poverty, hunger and malnutrition is clearly viable and affordable, provided that a strong political will exists," the heads of the three agencies wrote in an introduction. The FAO, the IFAD and the WFP said poor countries would need help to meet the goal. "Their funding gap should be closed, and this can be achieved through more generous international resource transfers than what has been the case in the last quarter century," they said. If no extra money is earmarked for hunger eradication, under a baseline scenario, the number of people without enough to eat will fall to 650 million in 2013, from current levels of 795 million, the U.N. agencies' report calculated. According to WFP hunger statistics, some 795 million people in the world do not have enough food to lead a healthy active life: about one in nine people on earth. Asia is the continent with the most hungry people - two thirds of the total - while Sub-Saharan Africa is the region with the highest prevalence (percentage of population) of hunger. 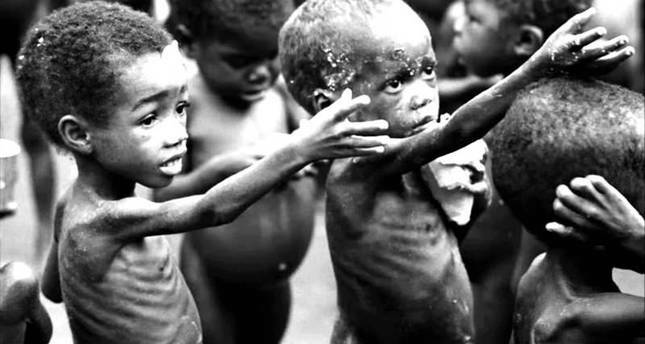 One person in four there is undernourished. Poor nutrition also causes nearly half (45 percent) of deaths in children under five, killing 3.1 million children each year. On the other hand, roughly 100 million children in developing countries are underweight, and 66 million primary school-age children attend classes hungry across the developing world, with 23 million in Africa alone.